If you know what you’re looking for, tap Search. Or tap Categories to browse by type of app. Want to tell a friend about an app? Find the app, tap , then choose the method. See AirDrop, iCloud, and other ways to share. Use Wish List. 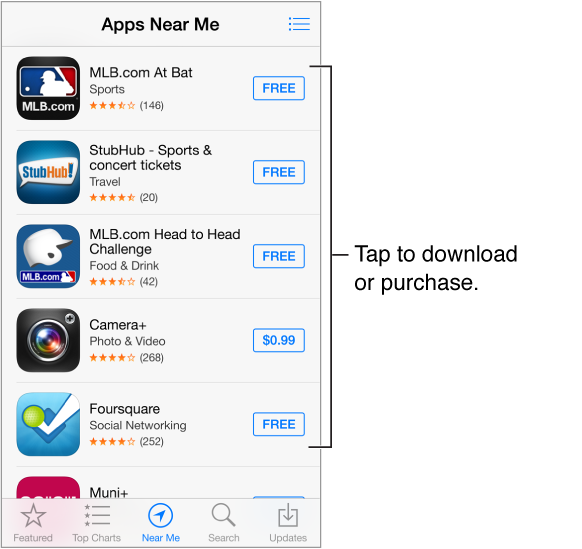 To track an app you might want to purchase later, tap on the app page, then tap Add to Wish List. What apps are being used nearby? Tap Near Me to find out the most popular apps others around you are using. (Location Services must be on in Settings > Privacy > Location Services.) Try this at a museum, sporting event, or when you’re traveling, to dig deeper into your experience.